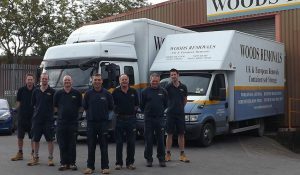 Removals Company Weymouth, Woods Removals Weymouth Ltd.
We’ve got 140 years of experience when it comes to moving people in and out of Weymouth and far, far beyond. All that time has given us an edge that it’s impossible to acquire any other way. We’ve encountered every conceivable moving problem and constructed every corresponding solution. Now we’re able to move our happy clients to and fro, heading off problems before they even so much as arise. We’re a BAR-accredited (British Association of Removers) company which means we’re held to high standards. Consequently, you’re assured a quality service that doesn’t let you down or hold you up. We’re fast without being careless and we always take the trouble to understand the precise requirements of your move, rather than just foisting a one-size-fits-all service on you. We know that the build-up to a move can feel stressful, so we’re here to diminish nerves, angst and worry. We don’t see why moving has to be an ordeal and we’ve honed the art with this in mind. For a century-and-a-half, we’ve listened to the feedback our clients give us and we keep changing for the better and better. When you contact us, we’ll send one of our estimators out to visit you and make a note of all the ins and outs of your situation. Then a clear and detailed quotation will be sent to you. We can help with far more than just getting you from A to B; we have skilled packers who know exactly how to package and protect everything from pianos to paintings so that they’re completely safe on route to their destination. We can just as easily reassemble everything at the other end, leaving you with a fully-habitable space right from your first night in your new home. Why should you have to leave in a cluttered chaos of boxes when you could just as easily let us get you properly settled in? We’re not like other removal companies in Weymouth – we’ll really go the extra mile.